The demonstratinos in Iceland and elsewhere have given rise to a variety of research. The demonstrations have raised questions and research projects gain more substantiation when these are backed up with real data. Many students have worked on and completed their masters’ project within the company. measure, promote and improve social acceptance of these technologies. Create Acceptance: Assessing and promoting societal acceptance of clean energy technologies. The project Create Acceptance contributes to facilitating the implementation of new and emerging sustainable energy technologies by assessing optimal conditions for the implementation of these new technologies in terms of socio-economic aspects, consumer preferences and citizen needs. The objectives of this project are to increase the competitiveness of RES (Renewable Energy Sources) and RUE (Rational Use of Energy) technologies by developing a tool that can measure, promote and improve social acceptance of these technologies. The results are a stakeholder management tool: ESTEEM which provides helpful guidance through the delicate work of interacting systematically all those who may be infliced by new projects. Prjoect mangers can take steps to look into the project design and the social context and their interaction with stakeholders. ESTEEM was formulated from former and current projects involving renewable energy technology. CreateAcceptance published introduction to the tool in the final newsletter answering questions such as What is it? Who is it for? And a quick overview of the webisite. Other cases are described in another create acceptance newsletter. A workshop was also thrown by the University of Iceland, dempartment of sustainable development in Janyary 2008. The University and INE ran a broader stakeholder workshop with the goal of setting a frame or outline a vision for new fuel types for the Icelandic market. The workshop was highly successful and the outcomes will be used to outline a future vision of an integrated alternative-fuel roadmap. Students at the University are processing the material that was collected on paper and tape recorder. The scenarioes will set a frame for various research projects in context with the SMART-H2 project where drivers, filling station operator and cooperating agents are collecting actual performance data on various new vehicles and disrtibution systems 2010. Icelandic New Energy is proud of having been on the team for the development of this tool, and will use it in future projects. It has been very valuable to widen the scope of public discourse in Iceland, inviting interrested parties to put INE’s experience of replying to critique and setting hydrogen into context with other fuel options. Students will be involded in work that can give answers to complicated problems for each type of scenarioe. The ulimate goals is to find steeping stones that can support an eventual shift of fuel in Iceland. Enjoy the short news flashes about the various aspects of the ECTOS buss project from the beginning. Four newsletters are attached in pdf format – a good starter for those who are interested in understanding how a demonstration project unfolds. The various cooperation projects in which INE participates, usually publish final reports or other publications. Icelandic New Energy has participated in numerous EC projects on topics that look at aspects of hydrogen used as fuel. These can have technical progress and performance, socio-economic view points or environmental impacts as their main theme. All ECTOS reports can be found here below. El-Mobility (Electric Mobility in the North Atlantic Region) was a two years project which ended in May 2012. The goal of the project was to test electric vehicles in different circumstances in the North Atlantic region by testing various electric vehicles in the Faroe Islands, Greenland and Iceland. In the demonstration efficiency and range was investigated as well as social acceptance. Also, marketing possibilities were researched. This undertaking aimed at mapping future energy corridors to Europe from neighbouring countries and renewable sources. It is a natural continuation of the Euro – Hyport project but the general trend was to look into Natural gas as the main energy source until 2030 but thereafter a more massive introduction of Hydrogen was foreseen. EURO – HYPORT (exporting Icelandic Hydrogen to European Continent). This project came to an end in 2004. One of the deliverables is described in the article issued in 2007 called Strategic selection of sites for hydrogen production. Availability of renewable energy, at present, is scarce on the European continent. Wind and solar power are still being developed and in the future of these two can easily provide Europe with far larger share of the total energy needed than the current proportion indicates. Still there are European locations that have high potential of producing clean renewable power, countries like Norway and Sweden produce large proportions of their power from renewable sources. Iceland, where all the electric power comes from renewable sources (hydro- and geothermal power), has utilized around 14% of its availalbe power (after evaluating environmental aspects). Hydrogen made with renewable power from water is not available in large quantities on the continent of Europe. With the increasing interest of using hydrogen for transport and other applications there may arise a new market for imported hydrogen. Hydrogen has mostly been made by reforming of natural gas and by electrolysis of water. Producing hydrogen from natural gas is not emission free, is as long as the electricity is derived from CO2 free power as in Icland.This project outlines the feasibility of exporting hydrogen from Iceland to the European continent. This includes production methods in Iceland (cost, emissions and other factors), form of hydrogen (liquid, gaseous, etc.) and efficiency of hydrogen production. Transport cost and method will largely depend on the form of hydrogen (liquid, etc.) and also on the quantity of hydrogen. Different containers/tankers will be investigated and marine regulations (standards/codes) will be examined through the European Integrated Hydrogen Project Phase II (EIHPII), also knowledge from the ISO – technical committee 197 – which is examining hydrogen and hydrogen components will be used. This will also include investigation of a submarine pipeline from Iceland to the continent (for gaseous hydrogen) and/or a electric submarine cable investigating production of hydrogen via electrolysers in Europe using renewable power from Iceland. Infrastructure at the receiving end is of high importance. There are different options depending on form of hydrogen (see 1 above). Cost/benefit of such different infrastructure will be investigated as that will give indications of what method of delivery is the most feasible. Market potential and end users of hydrogen will also be included in the study. This includes ways and cost of distribution . Also here a brief evaluation will be given to the concept of who will benefit from the global CO2 reduction, i.e. is it the consumer, the “green hydrogen” producer, the manufacturer of equipment using hydrogen, etc. Infrastructure cost for the modern society. Full scale hydrogen introduction into a modern society. Here Iceland will be used as a case study. This is a full scale indication of what would be the expected cost/benefit of the new infrastructure for a whole society, that is from fossil fuels to hydrogen. Different scenarios will be investigated; gaseous hydrogen and liquid hydrogen. These two candidates are the most likely to succeed in the near future. This includes the infrastructure for all transport applications including marine applications (fishing boats, ferries etc.). The task of roughly projecting the findings from Iceland to a European scenario could be done in future projects, however hints of how to adopt the infrastructure to the continent will be established. Public awareness of this new hydrogen technology is not well established. Introduction material to the key aspects of the hydrogen future will therefore be produced in a modern fashion. A 3D-cdrom disk will be produced showing in graphical ways (with verbal description using key European languages) the cycle of producing hydrogen, the distribution and the use of hydrogen. This will also include the emission from using hydrogen instead of the fossil fuels. This graphical version will then be put on the web sites of the projects partners and also on the Cordis (EC web site). The project is a major part of a joint European effort to evaluate aspects of the transition from the conventional fuel system to hydrogen powered transport system. The conclusions will be valuable for the European continent as it will add to the discussions of using renewable power to power the transport system of the future, and a step forward for Europe regarding the overall emission and fulfilling the goal of the Kyoto-protocol. 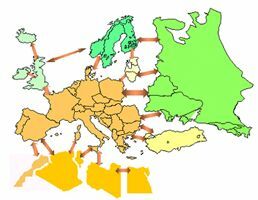 In 2004 the Euro Hyport project came to an end. The deliverables were three reports and an educational disc about the production and usage of hydrogen. Only in 2007 was one subtask published as an article in an international journal. Enjoy the strategic selection of places for large production of hydrogen for export from Iceland, based on Mr Hjalti Pall Ingolfsson study. It appeared in the International Journal of Hydrogen Energy. The co-authors are the Hjalti’s tutor at the University of Iceland. Icelandic New Energy was one of 26 partners taking part in this EU supported project. The aim of the project was to make a “handbook for approval of Hydrogen refuelling stations” which would be used to certify public hydrogen filling stations in Europe. This handbook was issued to Hydrogen refuelling station operators and local authorities. Fuel cells are known to have shorter life time than for example diesil engines and therfore continous use may reveal how sensitive the fuel cells are to prolonged strain. The goal is to run the buses and the hydrogen station for longer continuous periods, not to stop during weekends and find out the optimal running mode for the whole system. Still the buses are not only kept on a single route; they can show up anywhere in the normal public transportation system in Reykjavik. Icelandic New Energy can find out on short notice where they are in traffic. Students at the University of iceland and reserchers from several departments have conducted studies on social aspects. A report on these is called Social aspects of introducing hydrogen as fuel in Reykjavik. Hydrogen buses of the same type as the buses in Reykjavik will be used in several cities in Europe, in Perth in Australia and Bejing in China. The largest fleet will be operated in Hamburg, Germany. The goal of this project is to monitor the performance of the buses and the infrastructure, compile the outcomes of social studies within the ECTOS and CUTE projects and harmonise the dissemination of the lessons learned during all the tests. IN ECTOS it became evident that it is poosible make the fuel economy better and if only the systems are synchronized. The most important factors is to run the station in a contiuous mode and keep producing hydrogen for several weeks. Also to run the buses 6-7 days a week and raise thereby the demand for hydrogen. The buses have shown much better fuel efficiency if they run on longer distances and stop more seldom – just like other types of vehicles. Data that can reveal the differences according to various running modes will be collected during the HyFLEET CUTE. In Germany, the lessons learned during the tests will be used to design a second generation of the EvoBus fuel cell bus and MAN will put a bus to the test which runs on hydrogen but is equipped with an internal combustion engine. The project website is at www.global-hydrogen-bus-platform.com. Icelandic New Energy participated as a sub-contractor within the HySociety project, which came to an end in December 2004. HySociety was aimed at analysing Hydrogen projects and initiatives that have been taken throughout Europe and the social, technical or economic barriers to implement Hydrogen as an energy carrier throughout the continent of Europe. The project management was in the hands of the Institute Superior Technologico in Lisbon, Portugal. The project is considered a mayor input into the hydrogen roadmap for Europe. INTELECT was a NER-Electric transport funded 14 months project which started in March 2011. In the project companies from all the Nordic countries collected information on incentives for alternative vehicles in the region. The goal of the project is to support all those working in the field of alternative transport solutions – though main focus on electric mobility. The document should help all players working in this field and vehicle manufacturers to understand how incentives impact the pricing of vehicles in different Nordic countries. It should also provide policy makers with an overview of incentives available in neighbouring countries. One of the key elements of the project was to build calculators to understand the impact of incentives in the operation cost of vehicles and in the total cost of ownership (TOC). These calculators are now available and the project partners encourage everyone interested in the subject to post the project web site on their own sites or distribute it to relevant players as this is a public site and for everyone to use. Calculator A calculates the total cost of ownership, taking the different depreciation into the account. Calculator B makes it possible for the user to compare different types of electric vehicles to most types of conventional vehicles. The user can play with parameters like energy prices, parking fees, battery leasing and oil changes in the assumptions and see how they affect the results. The project partners sincerely hope that the project findings will stimulate the uptake of environmentally friendly vehicles and help policy makers to form future policy steps regarding environmentally friendly vehicles and fuels. The final report for this project is now ready and has been published here. All reports have been available at the Needs website. It was a special honer to work alonside great energy experts, amongst others the late Mr Woflrom Krewitt. This 15 month project, which started in February 2004, is a specific supported action (SSA) to ensure continued work on earlier national initiatives and EC projects concerning the use of hydrogen as fuel in marine applications. The foundations are the outcomes of projects as for example the FC-SHIP (ended in June 2004) and EURO-HYPORT (ended in July 2003). The New-H-Ship will bridge the gap in this field to assist the creation of a new European Research Agenda. Taking fuel cells and hydrogen aboard a ship will demonstrate a fairly new technology in a completely new environment, which is wet, salty and hard on electronic equipment. This offers new challenges related to the shipboard requirements. The aim of the project is to identify technical and operational obstacles related to the shipboard system-requirements and infrastructure for maritime fuels. As preparation for real demonstrations, the project will suggest mitigating actions so that investments and the technology for using hydrogen on board will be feasible and secure. Here you can find a poster from a presentation in Brussels. This study was organized as a support mechanism to evaluate and raise quality of suggested socio-economic research undertaken in future hydrogen lighthouse projects and be both supportive to the Joint Technical Initiative and for applicants who are kicking off their own hydrogen organization. The duration of the projects was 18 months. The participants organized first the areas they found of interest and drew up maps of the relevant social groups involved at each societal sector related to hydrogen projects. These were called socio-grams and display actors in each country /region where hydrogen demonstrations have been undertaken. Then partners from these sectors were interviewed and issued. In the same report a large table; a classified outline of the social studies that have been done so far was composed. This study matrix and the interviews gave rise to new ideas for social/economic research in the field. The table was first grounded in the projects Hy-Approval and HyFLEET:CUTE. This simple outline revealed that social studies carried out in context with hydrogen demonstrations often lacked substantiation, variety and helpful comments from the involved stakeholders. Often technical and demonstration projects, like some of the national projects referenced here, use vast resources for hardware while neglecting the human interface and cultural variations of both public and private perceptions as well as economic effects in the demonstrating countries. Integrating lessons learned from nationally supported H2 projects, Prepar-H2 begun with upgrading the social matrix, by adding results from social studies from recent years and then dig deeper. Views and comments were also be gathered from people involved with other alternative fuels and drive trains; Prepar-H2 simultaneously provided an economic comparison between hydrogen, other alternative fuels and conventional fossil fuel. The final outcome is information on social comments and values as well as economic data providing grounds for evaluation of the relevancy and quality of proposed accompanying measures in future hydrogen lighthouse projects. More importantly, findings from Prepar-H2 are not only applicable to future lighthouse projects but also have the flexibility to be applied to other H2 projects thereby successfully promoting H2 in societies through a thorough social and economic understanding of stakeholders’ perceptions, attitudes and actions. Deliverable 1 & 3 – Social studies in context with hydrogen deployment: Analysis, quality, gaps and recommendations. Deliverable 2 & 4 – Economic aspects related to introduction of Hydrogen as transportation fuel. Deliverable 5 – Practicalities of running hydrogen fuel chains: Recommendations for hydrogen projects based on interviews with experienced staff in this fuel service. Emphasis on Project design, administration and financial issues. Prepar-H2 poster – with highlights from the recommendations. Prepar-H2 presentation – a presentation from Jón Björn Skúlason that was held on the 22nd of November 2011 as a part of the Joint Undertaking (FCH JU) stakeholders General Assembly in Brussels. Rekkevidde started in 2011 with a grant from the Nordic Energy Research (NER) with the aim to improve knowledge on the range of electric vehicles operating in Nordic countries. Assessing range and performance of electric vehicles in the challenging Nordic driving conditions will help produce the complete picture of energy use for electric vehicles, and therefore make electric vehicles a more reliable choice for Nordic drivers. Phase II of the RENSEA project was kicked off at the end of January 2014 and is ongoing. It involves designing a regenerative plug-in hybrid electric propulsion system (RPHP) for sailboats. The design is made to be modular so that it can be fitted to different types of sailboats, but the focus is on the two sailboats Opal and Kallinika. Roads2HyCom (R2H) was an integrated project supported by the European Commission’s Framework Program Six (FP6), Priority 6.1 “Sustainable Development, Global Change and Ecosystems”. Roads2HyCOM is a project to co-ordinate, assess and monitor research in the field of Hydrogen for stationary and transport power. Its outputs will support planning of the HyCom initiative, which aims to develop hydrogen communities and stimulate growth in hydrogen technology markets. The Roads2Hycom supports 29 stakeholders from a broad cross-section (surface and air) in planning future fuel cell and hydrogen activities through web-based tools, handbooks, training workshops and reports and should assist to find and support communities that can implement hydrogen fuel chains at an early stage. The project started in March 2006 and Icelandic New Energy has been actively engaged by providing consultancy and assisting in developing an analytical framework for assessing hydrogen communities in Europe. The project ended in March 2009 having successfully developed tools to properly implement a Hydrogen community. To get an update on the project´s sctivities please read the January 2009 newsletter. The project uses quantitative techniques to assess European and global technology, Hydrogen infrastructures, and the needs of generic community types which define thresholds required for successful use of Hydrogen in communiites; considering technical, commercial parametes, safety procedures and socio-economic aspects of technology. In parallel, potential Hydrogen Community stakeholders will be engaged to support HyCom planning. This project will cover all aspects – the production of hydrogen, distribution, storage and conversion to useable energy by the end-user, in stationary and transport applications; and associated safety, security, regulatory and socio-economic issues. The project uses the expertise of independent research and technology organisations together with academia and key industrial stakeholders to conduct this assessment and provide strong links into many existing projects and initiatives. It will use the existing Technology Platform (Deployment Strategy & Strategic Research Agenda) and similar strategic and technical material as foundation-stones. Reference Groups will be used to engage a wide spectrum of stakeholders from industry and society. The project will deliver web-based calendars of research milestones and maps of research activity for access by the public and research community; together with reports which will assist the Commission in planning future research to support HyCom; and training manuals and dissemination directed at the wider community of interested stakeholders and communities. For further information please visit the project website: www.roads2hy.com. SMART H2 was a demonstration project testing hydrogen fuelled vehicles and vessels. The project tested various types of hydrogen-fuelled company cars and other equipment that runs on hydrogen, including a hydrogen auxiliary power unit for a tour ship. Amongst the car users was the car rental Hertz. The project aim was to demonstrate the infrastructure for compressed hydrogen as a self service filling station and develop further the distribution system, for example by organizing and running a small-scale hydrogen transport service. Special emphasis were be put on data collection, that actually extends to other types of fuel and vehicles that are also tested during the same timen period. SMART-H2 began in March 2007 and ended in 2010. The SMART-H2 will get data feed from methane vehicles, battery, -plug in cars and hydrogen vehicles both with internal combustion engines and battery hybrids. The Elding, a whale safari tourist boat, will be using an Auxiliary Power Unit, i.e. a fuel cell and battery unit that runs on hydrogen. The APU provides electricity on board for navigation, light and various other modules that run on electricity. The main intention was to be able to shut down the main engine when the boat has met with whales out on sea and offer the guests to see and hear the animals move and blow at the surface and to allow an ever closer encounter with the curious animals. A filling device was therefore designed on the peer where the Elding pickes up the whale safari tourists. The main engine will still run on oil but this test is a very important step to test hydrogen technology in marine conditions, which are damp, shaky, wavy and wet. A showroom explaining the main concept was installed in the hull of the ship. The hydrogen station at Grjothals is now open to the public. It is Shell in Iceland and Framtak hf who operate and monitor the station. The drivers of the hydrogen vehicles fill their own cars and therefore clear instructions have been put up on the hydrogen station that demonstrate that if instructions are followed carefully then safety is ensured. More than 20 organizations participated in the project, local and international. The main parties involved are providers of materials and technology (cars, other vehicle providers, fuel cell provider, storage tanks, classification and inspection companies, operators and maintenance staff of the hydrogen station, companies that lease vehicles, administrators and regulators). SUGRE (Sustainable Green Fleets) is an accompanying measure within the EC 6th framework program that promotes alternative propulsion and mainly focuses on captive fleets, but not only with regards to land transport. The main objective is to promote and support the conversion of fleets to alternative propulsion (ranging from bio-fuels, methane as fuel to hybrid systems comprised of combustion engines and electric propulsion systems) and the energy efficient usage of them. SUGRE will foster a positive attitude towards alternative fuels and new power train concepts using captive fleets as forerunners and proof for the viability of alternative propulsion. Site coordinators will organise the validation of the training/briefing materials, support the training/briefing and organise site visits for other fleet owners. We assume that two-way communication with fleet owners will greatly improve the efficacy of dissemination, due to the higher quality of the materials and the possibility of direct communication. As we deal with fleet owners, the impact with regards to the number of converted vehicles is proportional to the effort. By using the results from fleet owners who have changed to alternative propulsion systems, we will also gain good arguments for convincing individual car buyers. For air and water transport fleets are dominating over individual vehicles, so addressing fleets owners is the right way. A knowledge hub, implemented as an internet based communication and information platform, tools supporting the procurement and locality of refuelling sites and a support desk will be implemented. 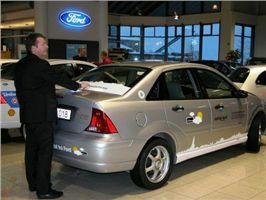 Icelandic New Energy sent a brochure to 7500 recipients (companies and communities) on transport policy and alternative vehicles in Feb 2008. This undertaking was sponsored partially by the SUGRE project. A second publication, training material for fleet owners is about to be launched in Icelandic. The goal of this joint technological initative, between Iceland and the US, was to evaluate fuel cells as back-up power for various applications. This one year project was funded by the United States Army Corps of Engineers and the Construction Engineering Research Laboratory (CERL). It is designed to provide better understanding of hydrogen fuel cells and to enable the project owners to exchange experiences. Learning objectives include issues related to installation, service, maintenance, the use and logistics of hydrogen, as well as reliability. Over one year demonstration period the goal was to start and stop the fuel cell over 400 times, evaluating the potential for using it as an alternative back-up power to batteries and diesel generators. WinDí, a new wind-hydrogen project in the Faroe islands – the first NAHA initiated project. This project is set out to find renewable energy solutions for small island communities, with a small island in the Faroe islands, Stóra Dímun as a case study. In this day and age many of the small isolated communities in the North Atlantic are dependent on electricity production by burning diesel oil. There is however a rising interest to use wind-hydrogen/battery systems. Some successful RD & D projects can be found in the North Atlantic region where wind power and hydrogen production have been conducted. One example is a project on Ramea Island (Newfoundland) with wind-hydrogen-diesel system set up by the initiative of Nalcor Energy in Canada providing electricity to 354 customers (total of 631 residents). This project, however, aims to scale down and design a much smaller system, which is something large industries have not been interested in as they see this as a very small “specialized” market. The proposed, community, is a Faroese island called Stóra Dímun. The island is located in the southern part of the Faroe Islands, with 14 residents. Diesel oil is frequently flown in by helicopter for their power production. The benefits of setting up such a system are manifold; cost reduction, currency savings, global warming etc. A project like this is vital for the countries in the North Atlantic region and it is important that we join forces to find a renewable solution for our isolated communities and at the same time reduce CO2 emissions. In 2014 the project got a grant from NORA and the kick-off meeting was held the 8-9th of September same year.